They stole my back brake cable last night. I didn’t realise until I came to the main road at the top of the hill outside our house. Luckily, they didn’t steal the front cable too! Never leave your bike locked up in the street overnight. That’s what they say anyway. When you start to learn about bike security you’ll see this piece of advice over and over again. And it’s always very definite. There’s no room for negotiation. Never leave your bike locked up in the street overnight. So what sort of nutter leaves their bike alone in the street in the dark for hours on end? Recently I came across this post from the brilliant Lovely Bicycle. She writes about turning an old Dutch transport bike into an “outdoor” bike, that’s left permanently outside. The reason is very clear: convenience. Her’s is a very heavy, unwieldy bike, difficult to carry through doors and up stairs. In fact, it’s not designed to keep inside. As she mentions in the post: with all the delicate parts protected from the weather, it’s designed to be left outside for long periods of time. And of course it’s far more convenient keep a bike outside all the time. You’re surely going to use it more often. So this is what she decided to do. She bought a sturdy Kryptonite lock, and chained the bike to some railings at the back of her house. Voila. A permanently outside bike. At the end of the post, she accepts that keeping a bike outside is not for everyone and suggests that we should weigh the convenience against how uncomfortable we are with the security (and probably the weather) issues. Because I leave my bike outside all the time too. And my girlfriends and my sons bike as well. We leave them locked to the same bike stand, out in the street opposite our apartment block every night. Why? Well, it’s the same basic reason that Lovely Bicycle gives: convenience. Theoretically, I could bring my bike into our building, lug it into the lift and then carry it through the apartment to our small balcony every day. As could my girlfriend and kids. But what a pain. I ride a bike for the freedom it gives me. I don’t want to be so constrained, so completely inconvenienced by the possibility that someone else wants my bicycle. The first bike I bought here, was such a ridiculous machine, a circus clown would have been embarrassed to ride it. I didn’t think anyone could possibly want it. So I bought an equally cheap, equally ridiculous cable lock to protect it. And of course the bike was stolen the very first night I left it outside. My first outside bike looked a bit like this. I thought no-one would want to steal it. I was wrong. The second bike to disappear was my girlfriends. It was a crappy old machine as well. But this time we’d bought a thick, armored cable lock to secure it. This one lasted a good few weeks. Maybe a couple of months. But eventually we came down in the morning and only the lock was left, in two parts, lying defeated on the ground. So this is when we got more serious. Each bike is now locked with a decent chain lock and a decent U-lock. They’re not super fancy locks. 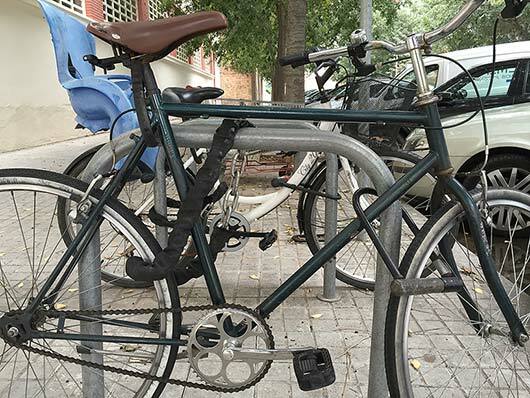 But although Barcelona is rife with bike thieves, they’re not very sophisticated. No ones running round with 42″ bolt croppers or hydraulic bottle jacks. Anyway, we’ve had no trouble with the bikes since we got proper locks. The bike components however, are another matter. We’ve had several seats stolen. Part of my brakes. My handlebar grips. And a bell. At one point the thieves seemed to be treating our bikes as their own orchard, picking and choosing parts as and when they fancied them. But you live and learn. You find out what works and what doesn’t. I now ride a bike without handle bar grips! My bell is super-glued in place! Not only are the seats secured with old bike chains, the quick releases are replaced too. And there’s epoxy putty in the hex sockets. And in fact, we haven’t had any problems for a long while. Now, many people might read this and think it’s just not worth the hassle and the heartbreak. For them maybe it’s better to keep their bikes inside. And that’s fine. That’s the point Lovely Bicycle was making at the end of her post: it’s not for everyone. It depends on your own priorities, on your own circumstances. But the important thing is this: don’t be afraid to go against the grain of accepted opinion. 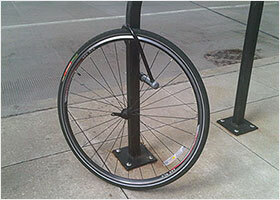 Successful bike security is more than just preventing your bike from being stolen. (Although obviously that’s the most important thing!) It’s essential that whatever security methods you employ don’t compromise the way you want to use your bike. Successful bike security is more than just preventing your bike from being stolen. You have to find that “sweet spot”, where your bike is safe but you’re not inconvenienced. You have to find that “sweet spot”, where your bike is safe but you’re not inconvenienced. We’ve found our sweet spot now. We lost a couple of bikes and a load of components in the way. But I’m pretty sure that when we come down in the morning, our bikes will still be there, the seats will (probably) still be there, and we can be off on our way with no hassle. And that’s really what I want for this website. I want to help people find their sweet spot. Whether that’s inside or outside. 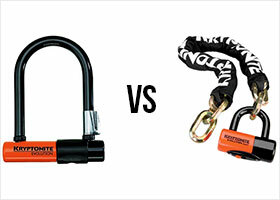 A lock or locks that suits their budget. A locking method that’s easy, painless. And a system that adequately protects their bike while they use it exactly how they want to use it. And preferably I’d like people to find this sweet spot before they lose any bikes! I’m not sure whether Lovely Bicycle still keeps her bike outside. The original post was from 2011. It would be great to get an update. But I know we’re not the only ones. So let me know if you keep your bike outside, or even worse outside in the street! Of course, most people don’t. But everyone should be looking for their own sweet spot. Have you found yours? Did you lose any bikes on the way? In my next post, I’ll give you my hard won, top tips for keeping a bike permanently outside in the street!